Earlier this week we saw British Airways present a B747 which had been repainted in the BOAC livery. 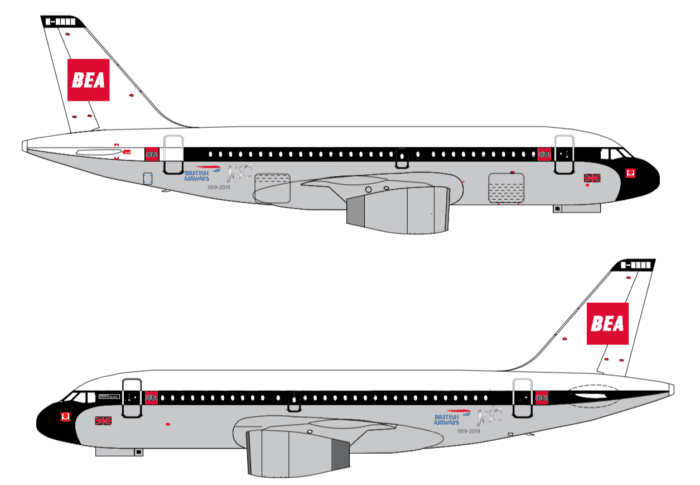 Today British Airways announced the next aircraft to join the heritage lineup, an A319 will be repainted in a retro BEA livery. The Aircraft, G-EUPJ is set to enter the paint shop this weekend. 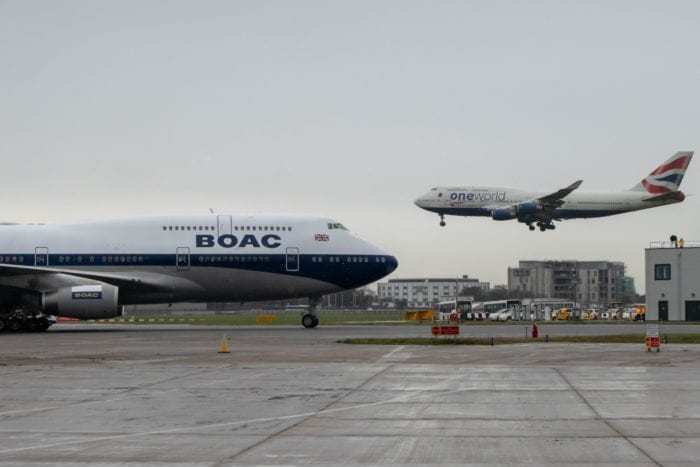 After it has been repainted, the aircraft will return to Heathrow and rejoin the fleet, much like the BOAC B747 has. No time frame has been given for the repaint, however, so we must guess when the aircraft will return. British Airways is repainting a number of aircraft in retro liveries. The reason for this is that British Airways this year celebrates its 100 anniversary. Although technically a different airline, on August 25th 1919, Aircraft Transport and Travel Limited started to operate scheduled flights between London and Paris. British Airways will, as such celebrate the actual centenary on August the 25th, however, 100 years is a big occasion. British Airways is hosting a whole range of activities throughout 2019 to celebrate the special occasion. The festivities are known a #BA100 and have so far seen 100 passengers treated to first class upgrades from economy on Valentines Day. British Airways is repainting a number of aircraft in retro liveries. While this not only allows people to see a livery outside of a museum, it also takes the celebration across the globe. Since Monday, the B747 repainted in the BOAC livery has flown to New York, Chicago, Washington, and is scheduled to fly to Lagos today. By repainting an A319, British Airways will further expand the reach of the centenary celebration. The A319, registration G-EUPJ, will carry the BEA livery across the UK and Europe, places the B747 won’t fly. As such, plane spotters desperate to see a retro British Airways craft will have even more opportunities, while individuals at Heathrow will be in for a real treat! The A319 will wear the livery until it is retired in 2020. Of course, as with any airline, safety is the number one concern. As such, BA will not be recreating the livery exactly as it used to be. 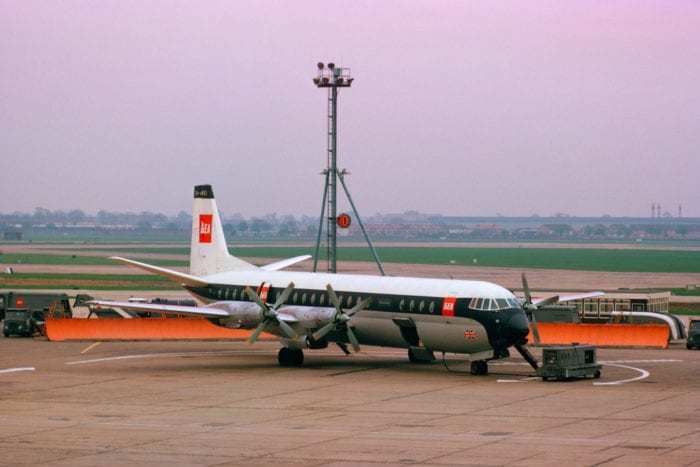 The original BOAC livery has red wings. However, only the bottom of the A319’s wings will be painted red. Instead, the top halves of the wings will be painted grey, this is to meet current aviation standards which state rules on the reflectivity of wing paint. While no date has yet been given for the rollout of the British Airways BEA A319, we at Simple Flying expect this to be in around two weeks. What do you think of the BEA A319? Let us know in the comments down below! I’m due to fly on the 319 next month, if inside matches the super job on the outside it will be a lovely experience. Looking good makes the aircraft look sleek if not slinky.